At 13, Matthew Sanford was paralyzed from the chest down in a car accident that killed his father and sister. His practice is an exploration of the “really cool subtle things that happen in a yoga pose.” This article was originally published in April of 2008. I came to yoga because I got tired of overcoming my body. That’s basically what I was told to do: get my upper body strong and drag my lower body through life. After 12 years of treating my paralyzed body as an object to overcome, I just lost so much of the joy of living. I needed to experience something different. I needed to feel my body more. I’ve never lived in the same town as my teacher, so the primary vehicle of my yoga experience has always been my own practice. That’s what a lot of students are missing when they just go to class. You can’t make things your own in a class and experiment with them and play with them. I can’t lift my legs. I can’t flex the muscles. But I feel a hum, a tingling, a buzz. My yoga practice is trying to understand the asanas. The instructions in an asana are intended to amplify your connection to that hum, and I don’t mean this in a touchy-feely New Age way. I literally mean there’s a hum. Because of my paralysis, I understand and appreciate that the sound Om is actually calibrated to that buzz, to that hum. So my yoga practice is trying to watch how alignment and precision amplify that hum through both my paralyzed and unparalyzed body. I can’t lift my legs. I can’t flex the muscles. But I feel a hum, a tingling, a buzz. I study Iyengar yoga. I’ve been practicing for nearly 17 years. I’m not so worried anymore about what complicated poses I can do. I’m much more interested in refining the base of a pose. If you can continually deepen or refine the quality of your base in any simple pose, then the rest just comes. Because I don’t walk, my practice almost always begins with some time to really feel the floor, the earth. So I’ll sit in dandasana (staff pose) and just really feel. I’ll then stretch my heel by pulling one foot back, because that’s what you get from walking. I warm up by doing what most yoga practitioners get by standing. I do full poses, but I also do parts of poses. I break them apart. For example, it’s too much work and takes too many people to help me get into headstand, shirshasana. So I have to start thinking about what’s going on in shirshasana that’s important for the spine and the mind-body relationship. I’m relatively confident now that the feeling in the spine in shirshasana is similar to the feeling in the spine in lotus, padmasana. Of course, pressure on the top of your head does something to your spine in space, so I might put a book on my head. I might do chaturanga dandasana (four-limbed staff pose) with my head slightly touching the wall. You have to learn to extend through your whole body. That extension has some similarities to what I imagine is going on when you’re lifting up into shirshasana. Like a quilt, I’m piecing together parts of poses. That being said, dang, I wish I could do shirshasana. I have shirshasana envy. I do yoga backwards. I have to intuit the feeling, the sense of direction. In general, when I teach yoga and adapt yoga and practice yoga, I have to go from the experience of the pose to the action, as opposed to going from the action—doing trikonasana (triangle pose) 3,000 times—to the experience. I do yoga backwards. I have to intuit the feeling, the sense of direction. I have to have faith in the building blocks. But isn’t that true for you, too? That’s really yogic realization, when you don’t get lost in the drama of the full pose, when you keep it simple. And then the other stuff just happens. Matthew Sanford is a yoga teacher, author, and public speaker. 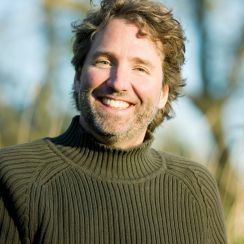 He founded the nonprofit Mind Body Solutions, which operates a yoga studio in Minnetonka, Minn. Sanford’s book, Waking: A Memoir of Trauma and Transcendence, probes the mind-body connection. Visit www.matthewsanford.com and www.mindbodysolutions.org for further information.